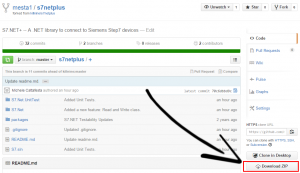 In this article I explain how to implement a Siemens S7 plc driver by using the open source driver S7.Net. You can find S7.Net sources on GitHub: https://github.com/killnine/s7netplus. S7.Net is a plc driver written in C#, this means that you don’t have to handle any interoperability with native code, but it just use OO programming and all the .Net features that you are familiar with. •	Can read and write bytes from a single area of memory, given a starting address and the number of bytes. •	Did I already say that it’s written in C#, no interop at all? •	Lack of a function that permit to read/write multiple non-connected variables with a single request to the plc. The documentation of S7.Net is here. To connect and disconnect you can use the Open() and Close() functions, to communicate you can use any of the methods to read and write variables from the plc memory. Every method return an ErrorCode, or the object that it’s supposed to return if there are no errors. Unfortunately this is quite a messy concept, because usually drivers throws exceptions in case of errors, or returns a value indicating the error and put the requested values inside a memory area passing a pointer to that area. Also some documentation on S7 protocol can be found inside LibNoDave. This paragraph explains how to get S7.Net driver and all the steps from compile the driver to add it into your application. You can choose to add download it from NuGet (fastest way) or to include the full sources in your project. 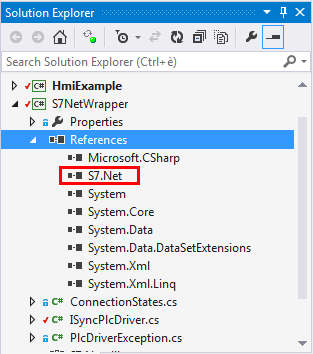 2)	Search for S7.Net in the online tab, then install it. 3)	Repeat for every project where you need the dll. 1)	Download the driver from the Github repository https://github.com/killnine/s7netplus. I know that create an application to showcase the use of the driver is difficult and will not meet everyone requirements, that’s why i tried to keep it as simple as possible, just to show how to create a PLC object, how to handle a polling to refresh the data read from the PLC and how to visualize the data around the application in a simple way. Also how to write data to the PLC. 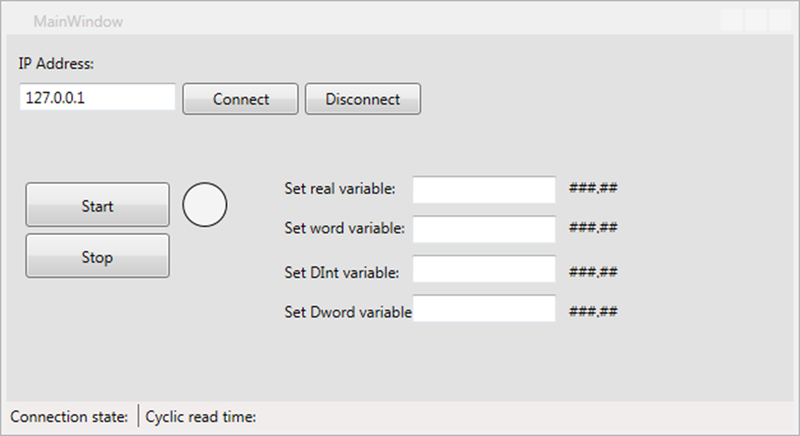 The sample application is a WPF application that can connect and disconnect from the PLC, read and write the DB1 variables on the PLC and visualize the values. The application contains 2 projects, one is a wrapper for the plc driver, the other one is a project that contains all the graphic pages. You can download the sample application on GitHub: https://github.com/mesta1/S7.Net-example. Using a wrapper for the plc driver is a strategy that I usually use to implement features that the plc driver doesn’t contain, and to abstract the most of the code required to interface the application with the plc driver. As you can see this methods are less and differents from the ones named inside the IPlc interface of the driver, and the reason is because I handle the communication errors by throwing exceptions, so the returned values can be just the objects that i need. Also I just use the highest level features of the driver, and handle all the complexity inside the wrapper. I use the concept of Tags inside my wrapper, where a Tag is an object containing an address and a value. This is familiar if you already used OPC Servers and Clients, but here it is much more simple and basic. In the main project I usually define the class that contains the PLC values and communication thread in a singleton. 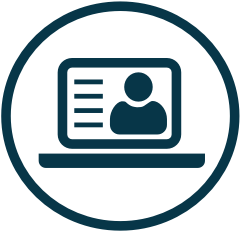 You can find the plc class inside PlcConnectivity folder. Inside the class there is a multi-threaded timer that will poll the plc once every 100 ms (see constructor). The timer callback is responsible to refresh the tags and to calculate the time passed after every read. You can of course use multiple timers, with different Interval value, to better manage the network resources. To read values from the PLC I use the feature that read a class directly from a DB. You can read an example of write and read in the handlers of the MainWindow page. Hey Mesta, thanks for the article. As the owner of the S7NetPlus project, I want to throw out the obligatory “I accept pull requests” for anyone who is willing to devote some time to improving the project. Also, I want to mention that this is actually a re-upload of the original S7Net project on CodePlex. The owner of that project gave me his blessing to fork it over to Github and pick up where he left off. He’s since moved on and wont be making changes. I’ve been pulled off this project for the immediate future but hope to get back to it in the spring. Prior to that, I’ll try to improve the ease of adoption by creating a NuGet package of this project. That way you don’t need to compile it yourself to use it. Create an issue on the GitHub page with any other requests, questions, or comments. Thanks! I’m glad that you liked the article. If you are familiar with NuGet, it will be a really good addition, because as you can see the biggest pain is to compile and add S7.Net to a C# project. I have some small enhancement to push, but I need some time for tests. Also i’m looking on adding some documentation. When i will have some update, i’ll make pull request. That’s great news! I will update the article as soon as possible. Article and sources are updated with NuGet package. Is there anyway to generate OnChanged events on the tags, or do you need to periodically poll the PLC for new values? I thought the s7 PLCs had something to allow this but im not sure. With this driver you have to periodically poll the plc. You have to implement your OnChanged event in your code. If you check Snap7 driver, there is a Partner configuration, but I didn’t spend much time exploring that driver. Request you please let me know the reason behind it. It’s because you have to restore NuGet package. Right click on solution, select “Manage NuGet package for solution”, push “Restore” button in the up-right part of the window that pop out. Then recompile the solution and it should work. Hi, mesto. i have a question on this step: 1) Right click on the project and select “Manage NuGet packages” hwo can i find this project? Then click on Project and near the bottom there is Manage NuGet packages. You can do this also in Solution Explorer. Thanks for your reply. I have downloaded the driver. I have a case here, what should I do if visual studio and Step 7 in two computers? Thanks! You don’t need step7 installed to make it work, and if you don’t have Visual Studio installed, you can just take the compiled binaries and run the software in the pc that has Step7. Thanks. But where is the compiled binaries? Could you send me the link? Appreciate for your help! 1. PLC simulator. When I open the project, open plcsim, download. it’s running. But when monitor the DB1 block, no value change? should I input some variable(tried to insert bit memory, not work)? 2. I have installed visual studio express 2013. when running your app., on the HMI, click ”connect”, it says ”connection error”. 2. I don’t support Visual studio 2013 express, you should download Visual Studio 2013 community edition. About the communication error, you have to debug your solution step by step, probably adding the sources of S7.Net, instead of the NuGet package. 1. I have followed your link. After setup a local 127.0.0.1 and restart server(Nettoplcsim-S7o-v-0-9-5), the connection error is gone, but no data got from PLCsim(PLCsim is running and I can see there are always 0 for all the four parameters in DB1). Another question: what is the usage of this package: Nettoplcsim-S7o-v-0-9-5-src? I will make a step-by-step video soon, but until then, you have to guess by yourself what’s missing, because I can’t debug it in your place. I did not see it listed, but I was wondering if this also works on the siemens softPLC, or just on hw PLCs? Hi, this is an implementation of S7 protocol, so if your plcs use this protocol to communicate with Step7 or TIA Portal, you can talk to them. i notice in the code that we have to specify cpu type. any idea how this would work with a softplc? in simatic manager main window, where you insert plc type, the softplc is under pc station. If the soft plc has an IP address, then you can just try to connect it by using the S7-300, that it’s the default. I could make the connection with the plc. So i want to know if i have to change for my plc the PlcTags or send any value or something i do wrong. And when its started how i can write/read data from the plc. S7.Net doesn’t support S7-1500, but you can edit the sources to support it. You have to download the sources and add them in the project, instead of the sources that you downloaded from NuGet. after all the list of supported plc. Then in my application example you have to target the S7 1500 by editing the sources. Also the S7-1200 and 1500 has to be configured properly. and scroll to the bottom to see a guide for s7 1200 and 1500. Thks to the help now i update the source code of the dll code increasing but still has the same error and will not let me start. Might help me with the topic I’m learning about this and need solving. Or i have to do another change in the code of the dll could you indicate me what i have to do to resolve please. The sample application was done to read memory from the PLC program made for Step 7 v 5.5. If you don’t have a DB1 in your plc, probably it crashes because the plc tries to read DB1 but can’t find it. Did you replicate the DB structures as they are in the S7_pro1 project ? Also did you configure the DB as Snap7 documentation suggested ? ok let me explain i have to connect with a plc to write and read data. (this is the second part of the offset and the number after the dot. per offset you can have bits from 0..7 before you increase the offset. So, I connected with that the example do the connection modified the system and update the dll with new Enum, etc. When i tried do the start in the project for read the data (i guest) i got that error. Sorry, I don’t see the structure of S7_pro1 project. 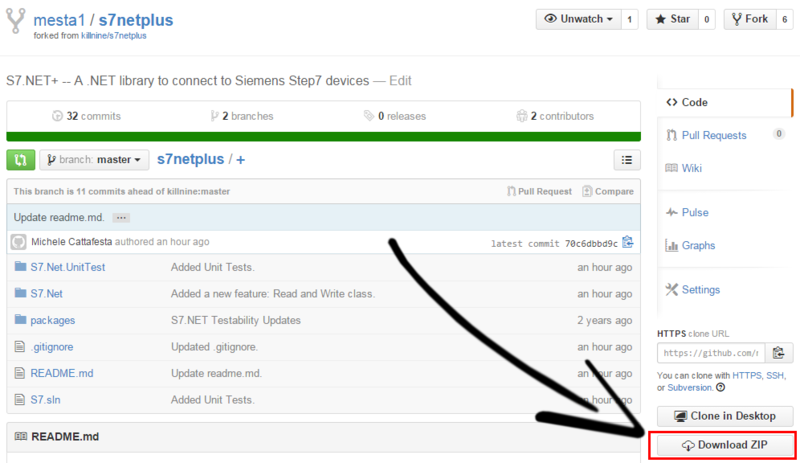 On S7.Net sources, there is a project called UnitTest. On that project you find a simple usage of the library. Probably you also need to specify slot = 0 and rack = 0 when you create the plc. Because as I read on other forums, S7 1200 and S7 1500 accept only this configuration. Make some tests and let me know, unfortunately i don’t have a S7 1500 CPU right now. so, could you tell me i write the 4000 and -100 into the plc? Yes you can put a breakpoint, go online with the plc and see if the memory changes. ok tell one more thing if i wanna write in the plc (“DB5”) i have to use : (“DB5.DBW2”) so if i understand to read the plc (“DB6”) i have to use Read(“DB6.DBW2”);…. Yes but you are reading only the word DBW 2.0. Now that you get started you can experiment by yourself, just by checkIng the code in the unit tests and in my example application. But please try to use comments, so other people can read it. I try to explain to your response to comments can be read by all and facilitate future developments. “Bool_Bit” How can I read / write these variables and how would represent by analogy to the example. “Double_Int_Number” it represents “DB6.DBD6”, is that correct? In other words if I want to read “DB_PLC_Input” I change the last value with the offset value assigned? The driver reads and writes bytes. If you want to read the Int_Number,offset 4.0, you should write DB5.DBW4 (2 bytes) + conversion. String and char are not supported at the moment, maybe someone will add a patch in the future. Usually it’s best to read everything in one shot, by using read class or read struct, or read bytes and get the array of bytes. You should use rack = 0 and slot = 0 to connect with S7-1200. Did you try with it ? I am a complete dummy on this matters. Thank you for the article. I have a question: I need, physically, to send an open/close operation, I mean to set the values to 0 or 1. How can I do this? Can I do it with Write method? Plc.DB1.cs :The following code was added. PlcTag.cs :The following code was added. MainWindow.xaml.cs : The following code was added. From the PLC, it is possible to read and write. However, the C # program does not read. Hi Jblee, there is a maximum limit on the size of the DB and unfortunately you need to edit the sources to get over this limit. I think the maximum number of bytes that you can transfer in one request is 200 bytes, so you basically read until DB1.DBW100. I’m not so sure about those numbers, you can do some tests by the way. To go after this limit, you need to send multiple requests. usually i get the A text but some times i get the b Text and i don’t know why. after a few tests the plc got frozen, and the pc wasn’t able to get connected with the plc so my code only returns me the b text. i solve it formatting the plc. Right now i just want to know where it can be the problem. Why are you opening the socket every time you start a communication ? You can keep the socket open and just close it if the plc doesn’t respond or if you close the communication. Did you try to keep the socket open ? Also check LastErrorString variable, it if contains some informations. 1 – Do we need to activate PLC for working with this program ? do we need to put some blocks ? 2 -Where can I find offset / address of this tags in DB: (I can see adress it only in Default tag table but in DB can’t see. Hi radek have you a solution? I have the same problem! 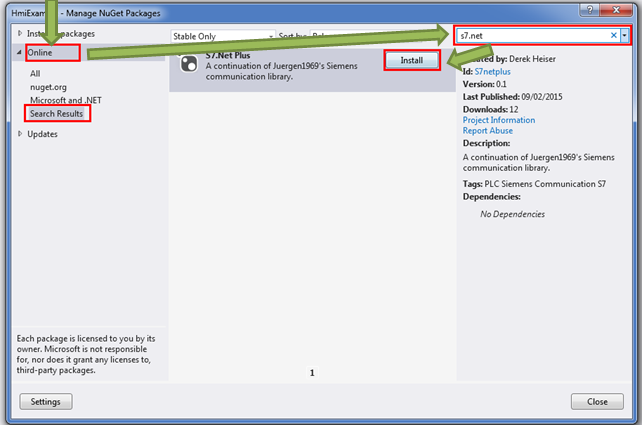 Hi i’m using vs2010 and Nuget, but S7.net simply doesnt show up when i would like to add this to my project. Is Visual studio 2010 not supported ? VS 2010 should be supported, but I don’t know if the NuGet package was made compatible with VS 2010. Try to download the sources, compile in VS2010 and add the project directly into your application. Sources should be compatible also with .Net 3.5. Thanks for this libraray projects.If u can do one video for how connect ,read,write and plc part too.we are reading reading but can’t achieve.Please in your video do tia portal as simulation and c# part.Like many people will understand and not ask so many question.Video is best training. Hi, I’ll see what I can do, but you can check Unit tests to see s7netplus/S7.Net.UnitTest/S7NetTests.cs to find examples on how to read and write different formats. can i have an example on how to connect to omron plc using modbus tcp/ip in c# ? your blog is a life saver. I usually save alarms and events on a database, and I do that just by polling the plc and checking if there are some of them active that I didn’t recorded already. When you are saving alarms and events on a database, how do you do to avoid writing inside the database the same alarm each time the timer is checking the status of the PLC? Hi, for alarms and events logging I use a dedicated class/thread indipendent from the plc, because there can be multiple plcs but the alarm logging is always a single part of the application. In the plc class I poll the plc to know the current state of the alarm, if it’s active or not. In the alarm logging class I scan the plc alarms to check if they are active or inactive. Once an alarm on the plc become active (from 0 to 1) I log it in the database and mark it with an “acknowledged” flag. When it becomes inactive (from 1 to 0) I reset the “acknowledged” flag. Thank you for introducing this useful library. I am now trying s7netplus and have a question, I am using s7-1200 PLC and checked ip(“192.168.0.51”), rack(0) and slot(1) from TIA portal. But I get ErrorCode = ConnectionError when trying to establish a connection. Instead, I get no error with rack = 0 and slot = 0, but always have an ErrorCode = WrongVarFormat from reading anything, for example, “var data = plc.Read(“MD5642″);”. Did I do anything wrong? Thank you. It’s a matter of conversion. Try to download the sources and look at unit tests. Writing the documentation is the next step that we are addressing. Hello, I’m now using this nice library, strangely, I’ve some incoherent values. Hello, you should specify what values you see on the plc, what you see from the library and what function of S7.Net you are using. Probably you need to check that you are reading the exact word and bytes, and using a correct conversion. Check the documenation to see how to make a proper conversion. I try to use your great library. I haven’t problem to connect to PLC, but everytime I try to read a variable, or set one, I have an error message “WriteData”. After this operation I don’t see any change in my PLC. Hello, you should download the sources and go through the code to check what’s wrong. Actually this may happen from a number of reasons depending on your code. Also if you are using S7 1200/1500 check the documentation to set the DB with Full access. Hello, how i can read input, output and merkers ? the read/write DB it is ok.
Hello, you can specify the datatype that you want to read in ReadBytes, and use the start byte address field to specify from where to start. Please can you post an example ? Thanks a lot. this code does not work. there’s not a write/read in the sample project. what can i do ? Hello Mark, the sample project shows how to use the S7.Net driver to build your application, it is not intended to be adopted as a general architecture for an HMI, as it is too simplistic. 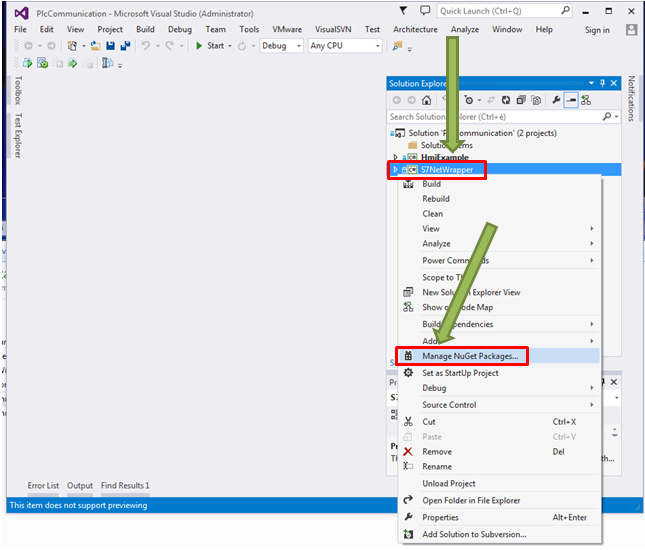 The code works with the S7.Net driver, but in the example the driver is abstracted away to show how to make an abstraction on the driver and implement just what you need. If you don’t need the abstraction, you can just replace everything with direct calls to the S7.Net driver, without extra-classes, interfaces and so on. This will make your life easier for the first steps. hello! Another question : i see that with the s7 300 the led machine in the project, change color by the bit DB1.DBX0.0 (green If i set it with start button and gray If i reset bit with stop button). With s71200 it is always gray but the DB1.DBX0.0 bit change it status. What i do to get the same in 1200? Thanks a lot! i test the connection a lot of time and with the s7 300 no problem. but when i try debug mode, in the label i can’t see the value that i write in the DB. the label value it’s always 0. Also the led machine is always gray. excuse me but i am a beginner with plc ! But if you are connecting on another slot (external card) you have to map it correctly. on tia portal i see the change of value when i write in the textbox but on the application i read always 0. Please open an issue on the repository S7.net and upload the plc program. Mesta, i found the error. In my plc program i’ve committed an issue. Now i can see and write all from the application. I have another question : if i write a value in textbox from the solution, i read it in plc in real time, but if i write a value on db by tia portal, i can not see it in my application. why ? thanks a lot for your disponibility. Great news! Can you tell how did you solve the problem, for future reference ? I see that in s7_pro (the program plc), in OB1 there are some instructions that must be copied to plc program. Now i create an ellipse and two button, one for set and one for reset a merker on plc. From Tia portal i can see the value of merker changing, but my ellipse doesen’t change color. Can you help me with code to read from plc ? We’re struggling to read any data in DataBlocks using this project and a S7-1200 PLC. Stepping through the source code we always receive the error “WrongNumberReceivedBytes” which is here in PLC.cs line number 332. We are calling “ushort result = (ushort)plc.Read(“DB120.DBW4″);” which exists in the PLC datablock. Is there an error with the number of bytes being sent in the “_mSocket.Send(package.array, package.array.Length, SocketFlags.None);” method causing the PLC to respond with the error? Did you configure the DB with full access ? See the last pages of the manual. i’m using S7.NET driver to read variables from S7300. I don’t understand how to show real value of a counter. If i show it as a counter i see 98 (the real value), while if i show it as decimal i see the value 152. So in my text field i visualize the real value of the counter. I don’t know if there is a better way, but this works. Howewer any suggestion is welcome. You can also use the converters in the library. Check the “Value conversion between C# and S7” on the user manual. Sorry, i may be wrong but this case is not considered in the manual. Do you have a more updated version of the manual? If you have to display hex values from bytes, ToString(“X”) is fine. I defined in S7-300 a DB with inside an array of “S5TIME”. My problem is when i try to do the opposit conversion (WRITE in the PLC). I’m not able to find the correct way to convert a double variable from c# to byte array for PLC. I tried a lots of way but i didn’t find the correct one. I don’t have a plc to make a test right now, but it seems that you should use a double. unfortunatly your suggestion doesn’t work. Remember that is not a simple conversion between differents types. Infact you have to implement resolution bits. I solved with the belowe function. Consider if it’s useful to introduce this function in your library. No, i don’t know why but the code you see in the comment is not the one that i introduced. I am trying exactly same stuff you are doing in the video. I have created Data_block_1[DB1] in TIA Portal V13. I unchecked the optimization block access property as you have said. Then I have enabled full access, and I have permitted PUTGET communication. I have only 3 integers in DB1 block named int1, int2 and int3 occupying offset values of 0.0, 2.0 and 3.0 respectively. I have established communication of PLC with my PC with no problem at all. I can monitor the values in TIA Portal. Address IP of PLC is 192.168.0.101 Then I started writing the code you have written after downloading S7 NuGet package. I have built the program with no errors. Now I will try to read DB1.DBW0.0, int1. I don’t know how I can get this error when I did exactly what you have done. After you call Connect() you should check the result to see if the connection was successful. I didn’t call “Connect()”. I don’t know what you mean by that. I cannot see any “Connect()” in your video? I figured out that PLC is available but not connected. What may be wrong here. I did everyting you did. When you call the method “Open()”, it returns an error code. You must check that the error code is “NoError”. The problem was actually CUPU not being not up-to-date. It worked witH PLCSIM. How can I connect my PLC Modicon M340 with C#?. I have searched a lot but no way. Sorry don’t know what you are talking about. Hello and thanks for your tutorial, everything id fine. the .ConvertToDouble() is not working right on those 64bit variables. If by lag you mean that the user interface is unresponsive, you are probably using the Windows.Forms.Timer. You should use a timer that ticks on a parallel thread, like System.Timers.Timer. i was write the code according to your video and it’s working. but when i change the coil state in the TIA portal, true to false or false to true my console application coil state will note change. it is in the previous coil state. but when i close the console application and again run it, it will show the present state of the coil. so i want to know how to modify this code in order to continuous monitoring. because i want to real time monitor the timers and counter values. I have a question about ReadClass or ReadStruct. I would like to read lot of bytes DB, but not all of them and they are in different place in DB, for example DB1.DBB10 and next one in DB1.DBB17 and so on. What ReadClass(ReadStruct) does actually? How to read this kind of situation as fast as possible ? ReadClass makes a call on ReadBytes, then assign the values to the class items. You can read up to 200 consecutive bytes with a single TCP call. If you have scattered data, you may want to use ReadMultipleVars. That’s the only way to read up to 200 bytes from different areas/addresses in a single call. You can use ReadMultipleVars. That’s the only way to read up to 200 bytes from different areas/addresses in a single call. You can find an example in the unit tests. Is it possible to establish communication between visual studio and simatic Manager v5.5 using communication interface MPI instead of Ethernet? You can only connect to a real plc or to PlcSim (the simulator that comes with Step7). With PlcSim you can only use ethernet, but you can use an external ethernet card and remove that later. Es posible trabajar esta librería con Windows Forms? O solo es útil para proyectos en WPF? It can be used also with Windows Forms. I want to know how I can do so that when you change the IP address of the PLC, that new IP address can be put in the textbox of the program in C# without having to stop the program, change and recompile. i notice that all the config/Examples are done to connect through TCP/IP is it possible to connect using MPI / COM port?? No it is not possible with this library. You should use LibNoDave for MPI communication. Hi Mesta, thanks for your good job. Is the library compatible with s7-200 plc? Hi Mesta, Thanks for your good job. Actually i am trying to read data from s7300 plc continuously, the connection with plc disconnects after 9th or 10th iteration in c# can you help me regarding this. You are doing something wrong. Can you post the code of the loop ? I am using S7-314 PLC to connect to c# application. In my application I receive the cputype, ipaddress, rack and slot and later connect to plc. I’m displaying errorcodes based on which error is thrown. Now if I select s7200, 192.168.0.1,0,2 to connect to plc, it is connecting to plc instead of throwing me errorcode as wrongcpu_type. Could you please tell me what may be wrong here ? Cpu type doesn’t make a check on the processor type, it’s only an helper that sets only the ISO message with the correct values for the communication. Those values are different from S7-200 and S7-300, so maybe the S7-300 is responding some sort of error message. Can’t check as I don’t have the hardware now. Could you please provide me a hint on where to catch these errors? I don’t think there is a way to get plc type consistently. Try to make a read after connecting to a variable that exists, like “M0.0”. If it fails, the configuration is wrong. Are you have test PLC project for TIA v14? Unfortunately i can’t install v5.5 under Win10, and i continiosly can’t to connect from their PLCSIM. if i try to set PLC ip address as ip address of my PC i have ConnectionError, if i leave 192.168.0.1 or something like that – programm can’t recognized them. All works perfectly with s7300 but i have a question. In step7 i have create a DB10, so a DB10.DBD4 and set data type to REAL. From a VAT i set it with a value for example 1.52 but how i can read it correctly from my c# application? How i can convert it and which kind of variable should i use? If i work with integer type all works fine. S7.Net has the build in converters. Check the manual or unit tests to see sample code. Ok i found a the class converte but please link me to the docs section. Thanks ! Hi, I found your site on google. I would like to read Data from a S7-1200. after searching in the web I found your site. Connecting to the S7 is successfully. but I have no DATA_BLOCK. is it possible to read the Data with the address. I have tryed but it do not work. attachted I add a Screen from the TIA. Also my sample Project. I hope you can help me. You can also read merkers. Start with plc.Read(“M0.0”); It should work. Hi, If i want read input from S7-1200 Sim. What’s the command should input? like Read(“I0.1000”) or (“I1000.0”)， i have try Read(“I1000”) but faild with WrongVarFormat. BTW，when i try read merkers and data block, all succeed, i don’t know why. Thks! I’m using fine S7.Net ReadClass() to pull each 500ms DB data into several text boxes on my winform application. This allows me to capture data changes and then write values to some PLC tags. Monitoring data exchange with Wireshark, everything looks OK, no such mismatching! Looks like it also occurred on your original “HmiExample” project. Did you experienced such behavior ? I’m thinking about read/write thread overlapping but unfortunately I’m not very experienced with all that. Thanks by advance for your answer! I have to see the code to judge if there is a thread problem. That issue is because Read class doesn’t check for LastErrorCode after executing ReadBytes. But I have literally 0 time to spend on that library right now, so if you want to fix it and create a PR you are welcome. I need to read a whole (big) DB from my CPU1500 into SQL management studio. Can this be done with your application. The issue is to connect with the PLC and read all the data continuous. I have some experience on PLC programming and don’t have practically an experience with C# programming. However. 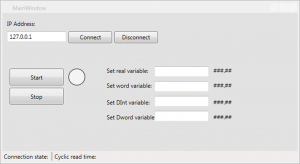 I managed to test some S7Net functions like read/write a Byte, Real and WORD. That’s enogh for now. That’s working. True, I did it with PLCSIM and NetToPLCSIM. In the near future I’ll have to test that with real hardware. So I need some clarifications on that theme. 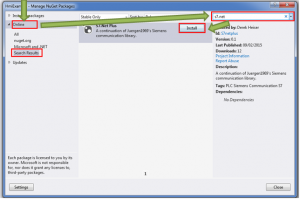 1) For instance, regarding sample proect called S7.NET. From where were taken these things like: PATH: ‘S7Net’ Project -> References -> directory ‘Types’ and fies ‘Conversion.sc’, ‘Enums.sc’, ‘PLC.sc’? 2) As far as I understand, there’s two ways to connect library to the project. The first on is via Project -> Reference-.>add Reference ->Browse. And second one is connection of sources. Am I right? Please correct me. By the way, that ‘nuget-pack’ from ‘gitnub’ page is not recognized by Visual Studio 2015. What about my first question? What are those files? By the way, I’ve just checked that ‘nuget-pack’ from github page is not recognized by VS2015. What about my first question? What are those files in the project tree? Could you look at code? Ican’t get what’s wrong. Hi mesta, i’m having an exception in S7 1200 PLC reading operation. It throws “Wrong Var Format” or it reads the value “10” which is not an actual value in PLC. kindly help me. Thanks in advance. var result = plc.Open(); // ???????? First of all I’d like to say heck of an article on how to use S7.Net driver. I have a problem reading/writing anything (bit, word) to a DataBlock in a program in TIA portal V13. I have enabled the PUT/GET option in the PLC, the DataBlock is global and I have turned off the optimize option. I am able to read that the PLC is connected and is available. The firmware on my 1214 CPU is: V 4.2.2. I’m using Microsoft Visual Studio 2017. Is there any advantage using s7.Net over Sharp7? trying to write from VB to real PLC is not easy way without conversion .